That said, I'm generally not sure how I feel about the story being split among the factions like that. I have to admit that there's a part of me that wants to accuse Bioware of bad storytelling because surely you can't rely on your players to play through all the classes on both factions to get the whole picture? Then again, The Old Republic is a game that actively encourages alting, so why not make it worth it? More story seems like a great incentive. Anyway, my second thought upon starting the Imperial story arc on Makeb was that once again the Republic SIS has absolutely nothing on Imperial Intelligence (even though it officially doesn't even exist anymore). I already noticed this with the introductory quests to operations, which for Republic side always seem to say something along the lines of "something bad has happened on [planet]; we don't know what it is but you must go and investigate", while the Imperials always seem to know exactly what the problem is and simply want you to go and solve it. The situation on Makeb is a bit different as Republic and Empire are interested in the planet for somewhat different reasons, but it's definitely noticeable that the Imperials start out with about as much information on the state of the planet as Republic players will have accumulated only after working their way through two thirds of their quest chain. There are other differences as well. While the Republic obviously considers Makeb important, it's clearly even more so for the Empire, as it gets emphasised time and again that you're on a "do or die" mission which will affect the fate of the whole Empire. Where the Republic goes all out with its fleet, the Empire only sends in a small group of people that at least tries to operate in secrecy. Personally I also thought that the Imperial story had more well-developed NPCs. The only area in which the Republic got a slightly better deal (in my opinion anyway) are the cut scenes - mostly because nothing beats this daring escape from the mercenary ship. Overall I found the Imperial story more intriguing though, and not just because of the irony of - SPOILER - the "selfish" Imperials being the ones who end up saving the planet. While the Republic appears to be in a pretty comfortable place, the Empire is clearly in a state of turmoil after what happened with the Emperor and Malgus. 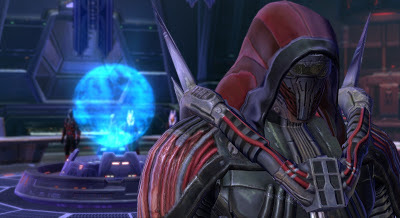 I like how we see Darth Marr taking the initiative and trying to be sensible about things (and not just because I like hearing his awesome voice), though I have to admit that all his talk of a new Empire and following new principles makes me worry a little that he's being set up for a fall similar to Malgus's. Either way, it's an interesting development and makes me look forward to whatever else Bioware has in store for the overarching story in the future - even if we probably won't see its continuation for a little while.